NOTE: MY BLOG POST ON JOEY YAP's 2018 FENG SHUI & ASTROLOGY SEMINAR IS OUT NOW. READ IT HERE. 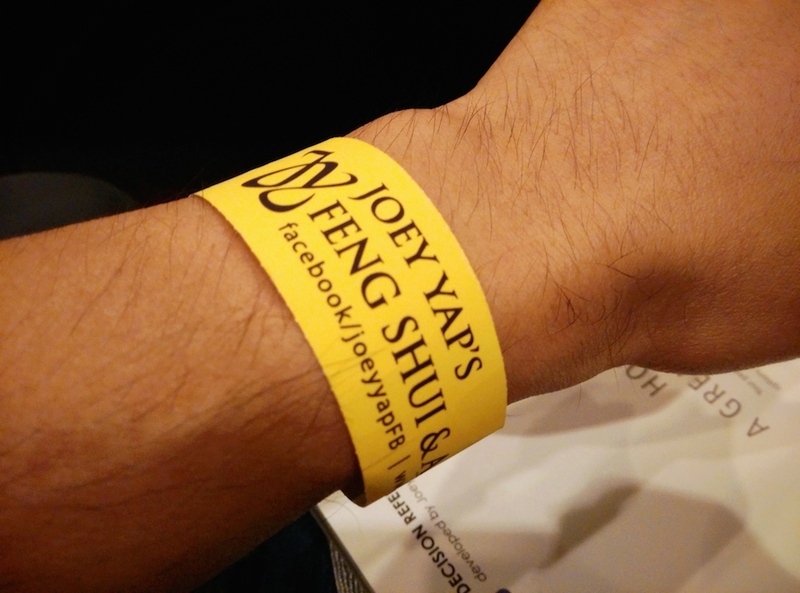 For the past few years I have been attending rather religiously Dato Joey Yap's Feng Shui and Astrology Seminar. This year is no different. So last Sunday I found myself at KL Convention Center where Joey Yap's 2015 Feng Shui & Astrology Seminar was held. The full-day seminar was to start at 10am, and I thought arriving there by 9am should be fine, but I was wrong. I was given the yellow wrist tag which means I ended up sitting right at the back of the Plenary Hall. It appeared that the turnout for this year's event was the largest ever with tickets fully sold out one week before the event! Last year, Joey Yap introduced Qi Men Dun Jia, another branch of Chinese metaphysics which is gaining lots of popularity and attention here in Malaysia. This year, he continued with more stuffs about Qi Men Dun Jia which I shall be sharing in Part 2. First, let me start with what Joey Yap had to say about 2015, the year of the Wood Goat. Of course, he did not just do a prediction out of thin air. Like all feng shui masters, he came out with the predictions by analyzing the Bazi Chart for 2015. Don't know what a Bazi Chart (also known as Four Pillars) is? Read HERE for a short introduction to Bazi. Knowing what's in store for 2015 is all well and good, but how is that relevant to you? For that, you need to match the information you gained from the 2015 Bazi Chart with your own Personal Bazi Chart. If you do not have a copy of your Personal Bazi Chart, you can download and print it for FREE at Joey Yap's website HERE. Just register first if it's your first time, and then enter your date of birth and time of birth. Take note that Joey Yap had upgraded the Bazi Chart Plotter with a facelift and also included personalised Annual QiMen and Bazi Stars which change yearly. So even if you have printed out your Bazi Chart last year, do take the effort to print it out again for the additional new features and information. The Annual QiMen and Bazi Stars will change after your birthday, so do print out another copy after your birthday! This is how your new Personal Bazi Chart looks like. This image is taken from the seminar booklet so please excuse me if it's not very clear. Take note that the Annual QiMen Mobility Directions and Annual Bazi Stars will change every year. Now let's take a look at the Bazi Chart for the year 2015. If you recall, the Bazi Chart for 2014 was not balanced with Water missing. That could probably explain why we had to deal with water issues. Transportation is under Water element, so maybe that could be why Malaysia suffered from 2 plane crashes and one missing plane? The 2015 Bazi Chart is more balanced with all the 5 elements present. However, Water element is still weak and the Metal element is weak too. Yin Metal (small metal) cannot chop Wood, so economy will be sluggish. Earth covers Metal, which may signify collapse of Earth - perhaps a tunnel related catastrophe? The Wood Horse from 2014 carries over to the 2015 Bazi Chart (hour pillar) - this signifies that some problems from 2014 will continue in 2015. Not exactly sure what problems will carry over but please, no more air disasters!! Wood represents wealth in 2015. If you have Wood in your Personal Bazi Chart, then you will be quite prosperous this year. However, if you do not have Wood, then look for Fire in your Chart. If you have no Wood and Fire, then at least have Water. If you have both Wood and Fire, that's pretty good. Water represents wisdom, so if you have all three - Wood, Fire and Water in your Chart, then you will be doing quite well in 2015! From the 2015 Bazi Chart, you can see that Wood is the strongest element, followed by Fire, Earth, Water and Metal in that order. As such, Wood industries (plantation, education, clothing, furniture) will be most successful this year. Palm oil industry and retail and services industries will also be doing quite well since they are under the combination of Wood and Fire elements. Finance industry will be weak as Metal is weak but there will be growth in financial advisory services as that is under the combination of Metal and Water. Health care industry will also be doing well as it is a Wood and Fire industry. Now take a look at your own Personal Bazi Chart. Can you find Wood on the upper row (Heavenly Stems)? Wood represents cash. If yes, then you will have lots of cash this year and everyone knows it, but you also end up spending a lot of your cash! If instead you see Wood on the lower row (Earthly Branches), then you will be having cash too but you will be saving them. And no one knows about it! Which one do you prefer - Wood on the upper row or the lower row? LOL! Joey Yap said that the upper row is better because you can invest your money instead of spending recklessly. He thought that saving money is rather silly since the current inflation is higher than bank interests! Next, look if you have Water in your Bazi Chart. Water represents profit. If the Water appears on the upper row, then your profit will only be a little. However, if Water appears on the lower row, then you will be enjoying huge profit! Is it possible to have Wood (cash) but no Water (profit)? Yes, because you may have received a large sum of cash from someone which is not considered a profit from business. Metal represents self element in 2015. So if you have strong Metal in your Personal Bazi Chart, then you have strong influence over others. In other words, you can easily influence others, which means you will be good in sales and in getting a job! As such, if you do not have Metal in your Chart, do not look for a new job this year. You will not be able to impress much in your job interviews. Metal also represents discipline. If you have no Metal, then you will most likely have no discipline. Having one or two Earth elements in your Bazi Chart is good. However, if you have more than 2 Earth elements, then you are probably having too much free time, and likely to be fat too! LOL! I am not sure if Joey Yap is joking or serious when he said this. If there is Fire in your Bazi Chart, you can count on having your own strategy. But if you have no Fire, do not bother to come out with your own strategy. Copy other people's ideas instead. Up till now, you already know that the three most important elements in 2015 are Wood, Fire and Water. Now if you have these three elements only in the Month and Year pillars of your Bazi Chart, then your career and friends are good. If they only appear in the Day and Hour pillars, then it is your family life and health that will be good. Of course, if you have them in all 4 pillars, then you have the best of everything. The Day Pillar for 2015 is Xin Hai which represents revolution or change. There might be many changes coming. Joey Yap jokingly said that already one change coming into the life of every Malaysians is expected in 2015 and that is, the GST! LOL. Joey Yap had preached about the concept of smart money and dumb money over the years. Briefly, smart money is money you make when you work for it and you know exactly how you earn it. Dumb money on the other hand, is money that falls onto your lap without you having a clue as to how you earn it. If you look at your Personal Bazi Chart and find all the three Wood, Fire and Water on the upper row (Heavenly Stems) except the Day Pillar, then you are one lucky fellow as you will have dumb money in 2015! Please give me a nice treat when you get your money! Haha. However, if the Wood, Fire and Water are found in the lower row (Earthly Branches), then you will have smart money, which is really not bad at all. Can't find all three elements in your Bazi Chart? Then maybe it's time to use feng shui to create better options and opportunities for yourself. Every year the afflictions and bad sectors change direction. In 2015, be aware of the afflictions at these sectors. The West sector suffers from a double whammy this year. Both the dreaded Five Yellow star and also the deadly Three Killings are here. If your bedroom is in this sector, try and move to another room. If not possible, then make sure that you do not disturb or accidentally activate the bad stars. Strictly no renovation inside or outside the house in the West direction or you may be hit by a host of serious problems like loss of wealth, illness, legal issues or worse, serious life threatening calamities. South West 1 sector is where the Grand Duke (Tai Sui) resides this year. No renovation or ground breaking activities here or you will suffer from mishaps, obstacles and calamities. Keep this place quiet as much as possible to avoid triggering it. Also, when it comes to important meetings and negotiations, do not face South West 1 or it will attract a negative outcome for you. North East 1 plays host to the Year Breaker (Sui Po) this year. Again, renovation and ground breaking activities are out of the question here. Activating this sector will bring about loss of money, illness, and other bad luck. Now the question is, what IF you accidentally trigger or activate these sectors? What if your neighbour decides to renovate a part of their house which so happens is your West sector which contains the Five Yellow and Three Killings? You can't ask them to stop renovating, can you? Do take note that these afflictions only take effect starting from 4th February 2015. Joey Yap provided a solution and that is, to activate all the good sectors first! Well, if you can activate the bad sectors, you can definitely activate the good sectors in the exact same way! By activating the good sectors, the bad effects that you receive will at least be reduced partially. So instead of a major catastrophe, perhaps you will only suffer a minor problem. Joey Yap suggested that we first activate these four major auspicious stars before 4th February 2015 as a preventive measure. These four stars are Dragon Virtue (North East 3), Fortune Virtue (South East 1), Sun (South West 3) and Moon (North West 1). Sorry if the image is not very clear. The directions of the four auspicious sectors are marked with stars. NOTE : All images from the seminar booklet are not allowed to be reproduced. I am not sure how long they will appear here on this blog. If I am asked to take them down, I will have to comply and maybe do my own drawings! In Part 2, we will be looking at the Flying Star Chart for 2015. With this chart (Joey Yap provided a more detailed Flying Star Chart this year) we will be able to know which sectors of your house or office are good and which are not so good, and what you can do about them. Also in Part 2 will be new stuffs about Qi Men Dun Jia, particularly the Five Charm method, and some explanation on the use of the Qi Men Mobility Directions and the Bazi Stars in your Personal Bazi Chart printout. And not forgetting of course what all of you are probably waiting for - the dates and times of activation for wealth, health, relationship etc. in 2015! Stay tuned!